Welcome to my website. I am a seasoned scholar, policy adviser and practitioner with over two decades of experience working on and in conflict-affected and transitional settings. My focus lies on issues of peacebuilding and transformative social change, and the processes, institutions and relationships that forge robust social contracts and build societal resilience. I am based in Johannesburg, South Africa, where I am an Associate Professor at the School of Governance at Witwatersrand University, and I direct Forging Resilient Social Contracts, a research and policy dialogue project. I am proud to have co-founded the internationally peer reviewed Journal of Peacebuilding and Development, and to be regularly collaborating with United Nations and other international organisations, conducting research and evaluation, facilitating strategic, policy-relevant processes and conducting trainings. This brings a strong evidenced based and practically grounded orientation to my scholarly work. For several years I have been deeply engaged in the International Dialogue on Peacebuilding and Statebuilding (New Deal) process, where I have the honor as serving as the first civil society Co-Chair of the New Deal Implementation Working Group. Click here to learn more about my profile. 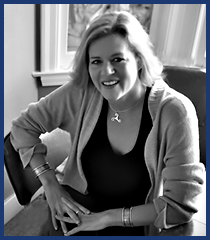 This website shares my work, offering perspective and insight into a range of thematic areas of scholarship, policy and practice that I'm engaged in, and hope you find resourceful. Please feel free to get in touch to share information, reflections and ideas for collaboration! The social contract is a term no doubt familiar to all. It has roots in antiquity and is often dismissed for being too steeply rooted in traditional liberal thought. Yet as the world grapples with extreme challenges, and evermore resilient competing ideologies and traditions evolve, it is hard to contest the profound value underpinning the notion of the social contract. Simply put: we need basic agreements about how we can peaceably live together. As part of a book project examining civil society's roles in peaceful, just and inclusive societies, this chapter focuses on civil society efforts to influence and shape policy at the highest levels, infusing peace concerns into the ambitious 2030 agenda. The analysis focuses on the strategies that civil society actors have employed - how they maneuvered within existing power structures and capitalized on entry points to influence the process. The chapter reflects on how the process and outcomes of the 2030 agenda moe us collectively towards a more universal, sustainable peace, and what further priority actions are needed to facilitate this. ​This report examines the nature and role of civil society in countries affected by conflict and fragility with the aim of contributing to policy discussions around inclusivity in peacemaking and peacebuilding processes. It reviews evidence around why inclusivity matters and reflects on lessons around the role of civil society in the New Deal process to date, and, considers potential entry points for ensuring meaningful inclusion of civil society in the effective implementation of Agenda 2030. ​This document offers a critical review of resilience and the evolving approaches related to its assessment and measurement. It explores how a resilience approach can inform peacebuilding, and conversely, how a peacebuilding perspective can support and strengthen the evolving resilience agenda. The publication can be downloaded for free here. 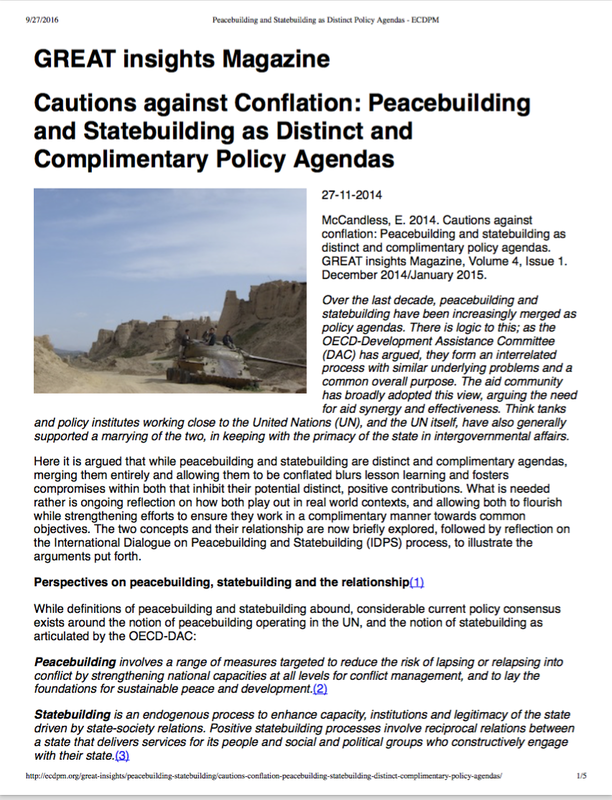 This short article critiques the tendency of policy-makers to conflate the concepts and practices of peacebuilding and statebuilding in international affairs. It makes the case for their distinctness to be nurtured in scholarship, policy and practice as a means of ensuring the important contributions of both are realised. “Latest Insights” section of “Building Peace”, Alliance for Peaceuilding's online forum for peace and security. In conflict-affected and fragile settings, national governments often lack strong legitimacy and authority across their territories. They are often challenged by powerful non-state actors that hold high levels of legitimacy with some populations, who may be performing needed services that the state cannot deliver. The article argues the need for greater attention towards engaging concepts, tools and arrangements that hold potential to reconcile competing sources and narratives of legitimacy in support of building and sustaining peaceful states.